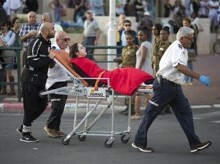 RISHON LEZION, Israel (AP) — Twenty-four-year-old shopkeeper Darya Zelenkov was working her shift in a downtown clothing shop in this central Israeli city when she was startled by a knife-wielding Palestinian trying to burst in. The quick-thinking saleswoman quickly slammed the glass door in his face. After years of relative quiet in major Israeli cities, a seven-week burst of violence has brought the Palestinian issue to the country’s heartland and pushed the long-festering conflict back to the forefront of the national agenda. Disillusioned by years of failed negotiations and a controversial withdrawal from the Gaza Strip, most Israelis appear to want to create more distance and separation from their Palestinian neighbors rather than revive peace talks. Ami Ayalon, a former head of Israel’s Shin Bet security service and current fellow at the Israel Democracy Institute, said despite the fear and anger, the unrest is having some unexpected results. He cited a recent poll showing more than three-quarters of Israelis ready to hand over Arab-majority neighborhoods of Jerusalem to a future Palestine, in contrast to the government position that the city must remain unified. Such findings raise the unsettling question of whether Palestinian violence works. Twenty years of on-again, off-again peace talks have yielded no solution to the conflict, partly because militant attacks frequently derailed them. But the first Palestinian uprising in the 1980s is widely seen as having hastened Israel’s decision to allow limited Palestinian self-rule in the West Bank, and rocket and mortar fire on Israeli settlements in the Gaza Strip was a key factor behind the decision to pull out in 2005. While Israeli leaders have blamed the latest violence on Arab incitement, Palestinians say this Israeli sense of complacency is a key reason for the unrest. They say Israelis cannot ignore them, and that nearly 50 years of military rule and a lack of hope for gaining independence are driving young Palestinians to desperate acts. With the attacks migrating away from traditional hotspots in and around the Palestinian territories to a normally quiet city like Rishon Lezion, situated on Israel’s coastal plain, it is becoming increasingly difficult for average Israelis to look away. Jews are nearly 80 percent of Israel’s population, and the Arab minority makes up about 20 percent. The latter often suffer discrimination and identify with their Palestinian brethren, but very few of the recent attacks have been carried out by Arab Israelis. It’s a sentiment shared by much of mainstream Israel. Polls consistently show a majority of Israelis still believing in the need for a two-state solution, but often on terms the Palestinians have been unwilling to accept. They point to two peace offers — in 2001 and 2008 — that were either rejected or ignored by the Palestinians, as evidence that a deal is impossible. The bitter experience of Israel’s unilateral withdrawal from the Gaza Strip, which paved the way for the Hamas militant group to seize power in 2007, has deepened suspicions. Yet many still believe that Israel must somehow figure out a way to separate from the Palestinians. The Palestinians seek a state in the West Bank, Gaza Strip and east Jerusalem — areas captured by Israel in the 1967 Mideast war. Israeli leftists have long said that the establishment of a Palestinian state is the only way to preserve the country’s Jewish majority. The alternative would be a binational state in which Arabs eventually outnumber Jews, which would force Israel to choose between being a Jewish or democratic state. They say the current violence, concentrated in Jerusalem and the West Bank where Israelis and Palestinians live in close proximity, gives a glimpse of what a one-state reality would look like. The tensions erupted in mid-September over conflicting claims to a sensitive Jerusalem holy site and have since spread to the rest of the country. In seven weeks, 11 Israelis have been killed, mostly in stabbing attacks, while 70 Palestinians have died by Israeli fire, including 44 who Israel says were involved in attacks or attempted attacks. In Monday’s attack, a 19-year-old Palestinian from the West Bank city of Hebron got off a bus in Rishon Lezion, Israel’s fourth largest city, and embarked on a stabbing spree along busy Herzl street. He stabbed an 80-year-old woman in the back and then a 31-year-old man in the chest, seriously wounding both, and after failing to enter Zelenkov’s clothing shop, stabbed another man inside the adjacent cosmetics store before bystanders finally took him down. Hours later, another Palestinian attacker stabbed a 70-year-old Israeli man in Netanya, a coastal city far from the front-lines of the conflict. Some half-dozen other Israeli cities have also seen attacks. The attacks have triggered angry calls for revenge that have turned violent in several instances. In security camera footage, a stream of Israelis is seen hopping over the collapsed elderly woman in pursuit of the attacker, who police later had to rescue from the angry mob. The victim’s granddaughter, Sagit Bracha-Eisenkot, said she was horrified that no one in the video stopped to help her wounded grandmother. “People talk about Israeli society, how it is unified in times of crisis. But you see on the footage the mob’s sense of rage and revenge,” she told Army Radio. In other interviews, she blamed Prime Minister Benjamin Netanyahu for the violence, saying that for security Israel would have to sit down and negotiate. But such voices have been rare. On Herzl street, near the site of the stabbing rampage, outraged residents flung insults at Palestinians, calling them “animals” and “mentally ill” and saying assailants should be killed on the spot.